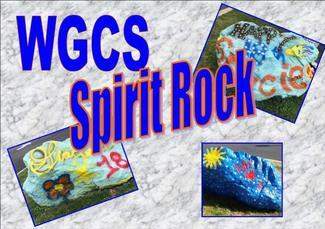 Reserve the WGCS SPIRIT ROCK TODAY! Enter your name in the slot below for the date that you would like to paint the ROCK. The ROCK remains painted in your approved design/message from SUNDAY-THURSDAY. You can paint the ROCK any day during that time period. IF the ROCK is not reserved after your scheduled date, your design/message will remain there until another family or event makes a change. Email Mrs.Hall [email protected] with questions. All proceeds go to help support WGCS Student Council.